Essays are boring. There, I've said it. Call it my thesis statement, ha ha. Essays are boring for me to write, and I suspect they are also boring for many others to write (I know the large majority of my students find essays very boring to write; that's why I have retooled my classes to shift away from the traditional essay to other kinds of writing). Essays are also, in my experience, boring to read most of the time, too. Of course, this is not inevitable, and there are ways people can hone their skills at writing essays, so that perhaps their readers will not be bored in turn. But I have to then ask: would that time spent honing one's essay-writing skills not be time better spent developing other kinds of writing skills? Test case: Brothers Grimm. Let's take Week 1 of this class as a test case for essays. Were they interesting to read? Well, no, I don't think so really. I turned in what I would call a perfunctory essay about the Brothers Grimm, as did thousands of other students (literally) ... and what a crime it is to turn the fantastic and imaginative stories of the Brothers Grimm into something as perfunctory as an essay. Of the ten essays I read by other students for the peer feedback assignment, they were all quite boring, with one exception, and I am sure that the student who wrote the almost-interesting essay would have written a brilliant creative piece, given the opportunity to do so. Same also for the people whose essays I read at their blogs and other public spaces. Sure, I can enthuse about people's essays no matter what (I'm a writing teacher, so I am good at enthusing) ... but whenever I read a good essay by someone, I figure that they could have written not just a good but a truly brilliant and memorable creative writing assignment. Just imagine if there had been not 5000 perfunctory essays, but instead 5000 new creative writing experiments that had come into the world last week as a result of the writing assignment. That, to me, would have been something really exciting, made possible by the massiveness of the MOOC. Soylent Green is people! 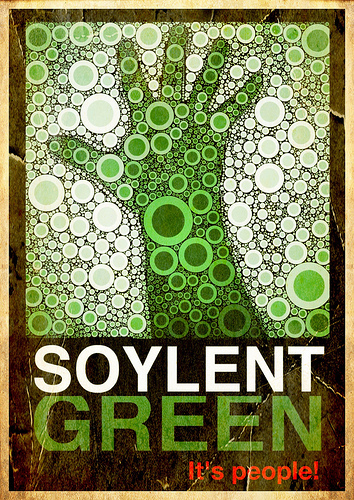 In that great scifi film of 1973 (one of my personal favorites), we learn that the mass-produced soylent wafers (in green, red, and other varieties; green is the most popular) which feed the overpopulated world of the future are not manufactured from ocean plankton, as the authorities claim, but instead from the recycled bodies of human beings. To me, that is the problem with essays: the impersonal format, like the cookie-cutter manufacturing of soylent green, takes all the humanity out of what we are writing. Sure, the essay is nutritious, and you can use it to "feed your head" - but it's just wrong to take human beings and turn them into wafers. I was staggered to see a discussion erupt at the class forum about whether or not the word "I" can be used in an essay at all. Yes, believe it or not, there are people opining mightily at the forum that "I" is strictly forbidden. So, just as there is no "I" in team, I guess there is no "I" in essay either, ha ha. Amateurs and experts. It would be different of course if this were a graduate seminar and we were aspiring academics. It would also be different if we were English majors and literary criticism was our chosen field of study. But that is not the case; we are just random people with an interest in fantasy and science fiction; we are amateurs in the best sense of the word - we are presumably taking this class because we love (Latin, amare) to read books like the ones on the class reading list. Yet even if we do not have expert knowledge about the topic to bring to bear, we do have our individual personal reactions, our eccentric creativity, our very own selves. To my way of thinking, that is what we should capitalize on. That is what I capitalize on in my own classes, and the results are pretty impressive; so far in this class, I have not seen any reason at all to re-introduce more traditional essay writing into my classes. Of course, there are still eight and a half weeks to go... and I'm committed to doing all ten weeks of this class to see what I can learn. So, I'll report back each week with some thoughts on the essays, both about my experience writing the essays and reading them, too. Plus, starting around week 5 of this class, I'll be reading my own students' stories at the same time as I am engaging with the essays in this class; that should be a thought-provoking experience for sure! I think you're being a little harsh on the humble essay. I agree that sometimes writing them can be a painful and slow process, and no doubt having to read many middling efforts is probably just as tedious, but every once in a while I found that things just 'clicked' and writing them was actually a pleasurable experience. I disagree that they don't count as 'creative writing' either; for me, having to find new and interesting things to say on a subject whilst staying within the constraints of the traditional essay requires a strong element of creativity. Would you say a sonnet-writer is any less creative because they've had to craft a verse within 14 lines and the recognised rhyming scheme? Are essayists that different? Part of these constraints of the essay of an academic standard are the avoidance of the first-person. The fact that this needs to be discussed on the forums touches on my general dissatisfaction with the course. It seems to have an identity crisis, is it to teach me things about fantasy and science-fiction that I didn't know before? Or is is an exercise in improving people's English and writing skills? Is it supposed to be at a higher education standard? If so, shouldn't we be using citations, references and bibliographies? And what form of referencing are we adopting, Harvard or footnotes? And so on and so on. Too many unresolved questions, so I've decided not to bother with the essays (too unbalanced anyway, 300 words for a whole book?) and will just partake of Rabkin's videos. Oh, and I whole-heartedly share your love of Soylent Green! Hi Gawain, thanks for sharing your thoughts - I wish we had some way to gauge the "spirit" of the class as a whole. I know there are some people who enjoy writing essays and who enjoy reading them too (presumably Professor Rabkin does, for one!). I'm just looking at from my own experience as writer/reader (don't like them) and also from my experience teaching Gen. Ed. courses at my school where most of the students don't like to read (many don't even like to read)... which has led me on a quest for reading and writing assignments that are productive and useful for as many students as possible. Here's something to ponder: in my classes, students CAN write a traditional "essay-about-the-reading" if they want, but they have a choice, with a more non-traditional, more creative type of essay option available also, in addition to the stories they write each week (each week the students in my Myth-Folklore class do a story retelling based on the reading, along with an essay: the essay can also be about the reading, like the essays we are doing for this class, OR they can be a more nontraditional, personal/creative essay about language and writing itself; details here). So, GIVEN A CHOICE, appx. 97% of the students choose the creative, non-traditional option, avoiding the option of "writing about the reading" like the plague. That tells me a lot - even the English majors, for example, and the journalism and professional writing majors, actually prefer to do something different. Probably because they are always writing essays in their other classes! Hello Laura, so nice to see you are taking the same course (Already enjoying your insights on google+). I liked this post very much, because I hated school. It took me many years, the internet and the kindness of sharing people to find out that I misunderstood something very important: I may hate school but I love learning! Still as soon as I find myself surrounded by people who have an "academic education" I get shy or nervous. I was late for the first assignment (work) and also a little scared, because to tell the truth, I don't have the slightest idea how to write an essay. So I found resources about it on the forum (thanks for yours! ), and read them, but as you say: essays sound awfully boring. all the essays are supposed to "enlighten" your fellow "very attentive students" but so many seem to focus on the grades and grammar. Two things I never cared for much. But I do enjoy the course! I never read "Alice" before, and with the annotations by Gardner it was a lot of fun. My favorite part is "Through the Looking-Glass". Have fun watching "Soylent Green"(my personal favorite too)! I am sure you have seen it before, but it's just so beautiful. Have a nice Sunday and wish me luck for my first essay. I will try to write it now. Celine, that cartoon is BRILLIANT - and I had not seen it before! I enjoyed it so much, plus it will be perfect for sharing with my students since the Aesop's fable of the lion and the mouse is one that they like so much (because, I suspect, it has a very positive message, unlike so much of the fables which are much more cynical in spirit!)... but with quite a different twist than the original story. Fantastic! The animation is also so good; I watched it twice, once for the story and then again just to look at all the wonderful visual details. I got out my Gardner book for Alice, too - Gardner is a real hero of mine, with all his puzzle books. He is surely the perfect person to comment on Alice for that reason; just imagine the conversations he and Dodgson could have had, talking about math and about words! About the class... I am so torn about it: some things I really like, but some things I do not like at all. What I really like are the things that make this so different from a typical college class... and what I don't like are the ways it really is imitating the college class - the idea of grading in particular. I'm also very disappointed at how uninterested Coursera seems to be in our experience, our ideas, our feedback about the course. But again, that is just like a typical American college class - on the last day of class, you pass around a survey for students to fill out... when instead what we need is feedback from the students at every stage in the process, not just at the end of the semester when they probably don't even remember very clearly what the beginning of the semester was like! You are very welcome! I am happy you liked it. I feel the same about the coursea experience. I don't think grading is useful...it's depressing how people react to it. Having to grade your fellow students is awful. Yesterday I had to review essays for the first time and it was so hard. Like you, I think sharing each others thoughts and essays could be very useful and interesting, but as soon as evaluating others is involved, it all falls apart. The important information gets lost and it just gets boring. Nobody seems to try out interesting thoughts, maybe out of fear to be wrong? Now I know why Rabkin repeated the words "attentive" and "insightful" over and over again. But I think it's the fault of the assignment and what it does to people. The forums that could be used to explore an idea you have with others doesn't work like this. It's more about showing what information you have, which is not bad at all but it's not enough either. One more thought: I have to admit I had my fair share of having to learn to live with criticism. Earlier in life criticism could stop me from trying things at least in public (luck has it that I am also a very stubborn person, so I just tried things anyway: safe in my happy but a little lonely tower). In some situations I still have problems with getting criticized. I learned it's much easier for me to accept and then learn from criticism, if I am free to do so. Then, even if I do not agree, I can think about it as an interesting thought...and then (instead of slowly cooking myself in anger and self doubt) I am already thinking about it which is all that matters. Grading is such a "not free to accept and learn from it" situation. I don't think it's productive at all. Thank you so much for sharing your thoughts here, Celine - I agree again and again. One really important thing for me that you mentioned is doing the writing in public; I think the emphasis on privacy and anonymity brings out the worst in people instead of the best. The environment needs to be safe and not a cause of fear, just as you say - but the benefits of sharing our work just to SHARE, not to grade, not to evaluate, is really important, especially in a course like this where we, the students, are basically being asked to do all the work. If an instructor wants to take responsibility for grading, that makes sense - but what we can do together as students, working with one another, is not the same as what professors do when they grade. I think we can be MORE useful to each other than grades and professors, which is why I am excited about the possibilities that this class offers. But if instead we are going to be forced to act like professors, putting grades on things instead of just sharing and learning from each other, I think the class will miss its potential. For some students, grading is a positive motivation... but even in those cases, it can become destructive in a new way: they are motivated by the grade ONLY, and the whole idea of learning is forgotten. Anyway, I was glad to read your thoughts this morning here. It cheered me up! Yesterday when I found an essay that had plagiarism and then also read at the forums about other people who found essays with plagiarism, I got so depressed that I just wanted to stop participating in the class at all. I know that grades can be destructive and that essay-writing is not the best option for all students (for some, yes, but surely not for all)... and now I have seen in this class exactly what happens in regular college classes: because some people just want the grade and are bored/confused by the assignment, they are willing to copy other people's words and turn them in as their own. SO DEPRESSING. I still believe in the potential for education here, but I am so sad to see that the grading and the assignments in this class that is voluntary, just for learning, also can lead to plagiarism. Plagiarism...Oh my, I just searched for it in the forums and boom, never thought that it would be such an issue. It's hard to have an original idea that is not build or inspired by someone's thought and I was expecting the silliness of school, where people sometimes fight about who had an idea first. But I never would have thought people go and copy whole texts from the internet (even amazon reviews!). That is depressing. Why would you do that? Why would you take the course in the first place? It's the wrong motivation: getting somehow through it like through school, just to get your grades. Or maybe the other option: being scared that what you have to offer is not good enough. But to be honest I don't care so much about plagiarism, I never wanted to get anything more out of the course, than learning something new in an environment that provides a wealth of information to swim around in. And this is happening at least for me. It's sad that it could be so much better, because reading uninspired copied essays, for sure is a waste of time. But don't get too depressed. It's wonderful that we can take this course! I want more. Let's hope through time things will change and become better. Gawain and Céline make great observations about their Coursera-ing. How academic are our 300-worders supposed to be? For the Alice essay, we need to start citing sources. I listed the works used to help draft my thesis, but I didn't follow any specific formatting. If I get docked for that, so be it. I'm taking the course because I enjoy fantasy/scifi. I knew the reading list would make for great compost as I complete the fantasy novel I'm writing. However, our weekly essays are doing some interesting things to the rhythm and voice I've been using in my novel writing. I need to keep an eye on how it changes up the story I'm telling. Hi Theresa, that citing sources apparently is a result of the outcry from students last week about how they wanted to cite their sources and it was getting counted against the total words. So, I can see why the Coursera programmers gave them a separate box, no problem. Why they made that box REQUIRED is a mystery to me, and it really conveys the wrong message in my opinion. I am really intrigued by the idea of how this kind of essay writing could interact with your novel writing! Just speaking for myself, I keep thinking of all kinds of great storytelling we could be doing: in Dracula, for example, all the different journals and letters and newspaper articles give you a whole panoply of points of view, while at the same time suggesting all the things that are MISSING too - the diaries and thoughts of other characters, for example, or the scenes that just cannot be conveyed in any of those chosen formats unless we were to have the Count's diary itself... that markedly missing diary whose contents we have to supply from our own imagination! First off, I have to say how much I enjoy your posts, Laura! Now that the fan girl gushing is over, let me address the main issue: the essays. I really enjoy the idea of writing a short text about one aspect of a book. To me, it is clear that the intent is not to analyse it in depth, but to highlight an interesting aspect, to tell others "hey, here is something I thought about" and that something will, hopefully, also spark ideas in the reader's mind. The short length forces us to focus and distill one clear, shining thought (yeah, good luck with that - it is hard!). This approach allows all of us to contribute something, no matter what our backgrounds. However, the forum discussions have dampened my enthusiasm. Not only the negativism and focus on how lacking others are, but also the emphasis on "correct" form, on citations and academic formalism. While this may be important to a subgroup, it is also intimidating to a different set of students. Instead of enriching the course, I fear this will cause many to feel out of their depths and simply drop out. I do not mean to imply that a good text, well written and clear, is unimportant. It isn't. This is the very heart of the assignment. Improving my writing, my ability to convey ideas succinctly, is one of my personal goals for this class. But I have no plans to adopt academic writing. I do not have the necessary background, I do not have the right bibliography at hand nor do I want to go through my large pile of books to find the statement I want, in order to properly cite it. I nearly didn't do the Alice essay. Depending on how things move on, I may just follow the next lectures. I see - I would love some creative writing exercises as well. As a side project, I am working on visual ideas from the books we are reading. The Grimm design is nearly done but Alice is, always, uncooperative. As for essay feedback, I was told that I could not possibly use a question in an essay. Sorry, using questions to lead the reader's line of thought can be very effective. I see no reason not to do use this technique (even if I didn't quite nail its usage). I see what you are saying about the read/watch dynamic. I would probably still keep up with a study group and the blogs (yours in particular!). Perhaps selected forum threads as well. Well said, Laura. You know, I was thinking the same thing: "there has to be a better way." One way I was thinking of was why not allow a student, or a group of students, to create a Librivox recorded book version of one of the works? Or write a parody of "Frankenstein" called "Frau Bluecher?" That would be equally as engaging. And a lot more creative than me trying to write a 320 word essay (the course's word limit) describing Shelley's view of morality in "Frankenstein." I doubt I could write it better than the journal articles I ended up citing. The coursera staff are giving their time as well and for free. Have a little respect. Anonymous, what makes you think that Coursera staff are giving their time for free? It is not a volunteer venture. We are not paying for the class, true, but their long-term goal is indeed to make money (they are a business), and Coursera is getting the benefit of our participation to develop their model. They have raised millions of dollars in investment money; so, no, it is not a charitable venture being run by volunteers.